Terex|Finlay, recently hosted an Americas customer open day in San Antonio, Texas. In addition to US, South American and Canadian based visitors there was also an international flavor with customers and dealers in attendance from Ireland and Russia. 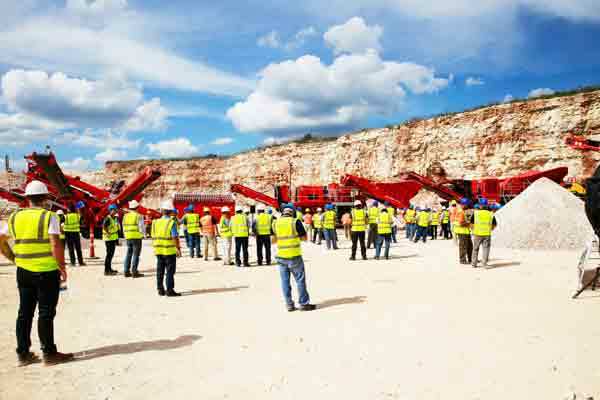 The event and product demonstration were hosted by Martin Marrietta, Medina quarry, just outside San Antonio and saw Terex|Finlay unveil three new machines at the event. These were the first production models to reach American shores. The onsite demonstrations featured eight Terex|Finlay machines in three working demonstration zones and one machine on static display. Featured the NEW I-140 impact crusher feeding into the mammoth 893 heavy duty forward facing screen. The headline act, incorporating the J-1170 jaw crusher, NEW C-1540 cone crusher and NEW 674 inclined screen. Featured the mid-sized 873 heavy duty forward facing screen. “It was a huge pleasure to welcome so many customers to yet another successful Terex|Finlay Americas open day. Our new product developments this calendar year have been unprecedented. We place a lot of emphasis on listening to what our customers’ tell us they want and need from their equipment day in day out and judging by the feedback that we have received on the new product launches we are definitely on the right track with our new product development initiatives. To our hosts, Martin Marietta, Medina, “Thank you so much! Working with you was a pleasure from start to finish, and we feel so honored to have had access to such a great site. Thank you for making our open day, the success of the event was in large part due to you guys and your committed colleagues! Additional details about each of the machines on display at the Open Day. The Terex Finlay I-140 shapes the future through innovation. This new generation impact crusher with redefined style and advanced technological design gives improved material flow and production capabilities in quarrying, mining, demolition and recycling applications. Incorporating the Terex CR032 impact chamber with direct drive and advanced electronic control system the machine provides operators with high material reduction ratios and produces a consistent product shape. The high productivity, ease of maintenance and operation makes the machine an ideal solution for large scale producers and contact crushing operators. •	The ease of material flow through the machine has greatly improved. •	With each component increasing in width as the material moves through the machine. •	Fully hydraulic assisted apron setting features makes adjustment of the aprons convenient and efficient. •	Heavy duty vibrating feeder (VGF) with integral pre-screen removes dirt fines and sizes bypass material for reprocessing. The fuel efficient direct drive Terex Finlay C-1540 cone crusher is the optimum machine for medium sized producers and contract crushing operators. This efficient and productive machine features the proven Terex 1000 cone crusher that is choke fed with integrated level sensor, automatic tramp relief and hydraulic closed side setting (CSS) adjustment. The large hopper/feeder has an automated metal detection and a purge system to protect the cone and reduce downtime by removing metal contaminants via the purge chute. Additional benefits include rapid set up time, ease of maintenance, high reduction ratio, high output capacity and advanced electronic control system. The Terex Finlay 674 is a compact easily transportable machine that offers operators rapid set up and tear down times. The screenbox features three decks giving a large screening area of 170ft2 to provide efficient screening even at small fractions and high capacity. The screenbox features quick wedge tensioning, access holes and bottom deck hydraulic tensioning system to reduce time required for mesh changes. All four discharge conveyors are adjustable and hydraulically fold for transport. The fourth product ‘oversize plus’ conveyor has variable tilt and side slew to accurately discharge material for recirculation and stockpiling. •	Triple deck screen with galvanized all round fixed catwalk access for ease of operation and maintenance. •	Recirculation to crushers or for stockpiling. •	Maximum utilization of the three decks provides ultra-efficient screening capabilities even at small aggregate sizes. The Terex Finlay 893 is a highly versatile and aggressive machine engineered and built for working in large scale quarrying, mining, construction and demolition debris, topsoil, recycling, sand, gravel, coal, ore and aggregate applications. The plant has the capacity to process at a rate of up to 800 tonnes per hour and can be fed either by a tracked mobile crusher, shovel or an excavator. Depending on the application the working angle of the aggressive screenbox can be hydraulically adjusted to between 14 – 18°. A key feature of the machine is the capability to change the working angle of the hopper/feeder. The working position can be lowered so that it can work with ease with a mobile crusher. The hopper/feeder working position can be raised to provide a reduced feeder angle when operated in direct mode from an excavator or shovel. The screenbox top deck can be fitted with a variety of screening media including; Mesh, Punch plate, bofar bars & Tines. The bottom deck can be fitted with mesh, punch plate & cascade fingers. This fully self-contained plant can be hydraulically folded and ready for transport in less than 30 minutes making it the ideal machine for large scale contract screening projects where a highly productive and dependable screen is paramount. •	Versatile aggressive screen box can be easily adapted to suit many applications. •	Modular configuration screen box with 6.1m x 1.83m (20’ x 6’) top deck and 5.5m x 1.83m (18’ x 6’) bottom deck screen. •	Screen box angle can be hydraulically adjusted to an angle between 14 – 18°. •	Screen box discharge end can be hydraulically raised 600mm (24”) to facilitate efficient and easy media access and changing. •	All stockpiling conveyors are hydraulic angle adjustable with hydraulic extending head sections for maximum discharge & stockpile height. The Terex Finlay 873 is ideally suited to working in aggregates, sand and gravel, top soil, construction demolition and recycling applications. This highly versatile machine can be fed either by a tracked mobile crusher, shovel or an excavator and has the capacity to process at a rate of up to 450 Tonnes per hour. Now available with dual power technology option. On-board electrical motors allow flexibility to run from an outside power supply or standard onboard engine. •	Screen box angle can be hydraulically adjusted to an angle between 13- 19º. •	Screen box discharge end raises hydraulically 500mm to facilitate mesh changing. •	Screen box can accept punch plate, cascade fingers, bofar bars and speedharps. •	Galvanised access catwalk on both side of screen. •	Oversize conveyor angle can be adjusted from 18º to 24º. •	1.2m wide Belt feeder complete with 7m3 manual folding hopper. The Terex Finlay C-1545P incorporates the Terex 1150 cone crusher driven through by direct clutch drive with variable speed, automatic tramp relief and hydraulic closed side setting (CSS) adjustment. The machine features an on-board forward facing prescreen module with a 2.1m x 1.52m (7’ x 5’) single deck screen for removal or bypass of fines from the feed material. The fines material can be discharged from the machine using the optional on-board by-pass conveyor or reintroduced onto the main product conveyor. Both methods improve the overall plant throughput capacity; product flexibility and liner wear reduction. In applications where pre-screening of the feed material is not required the module can be hydraulically repositioned beneath the hopper/feeder. This provides a more compact working envelope as the feeder/hopper can hydraulically adjust to feed directly into the cone chamber. •	NEW Terex TC1150 cone crusher provides high reduction and productivity ratios and gives excellent product cubicity. •	The forward facing pre-screen module maximizes production and reduces wear on the chamber by removing fine materials before it enters the cone. •	The large hopper/feeder on the plant has an automated metal detection system to protect the cone and reduce downtime.